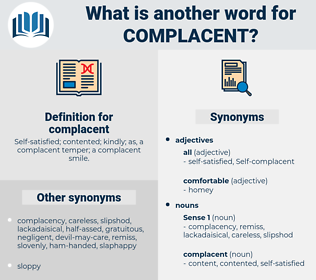 What is another word for complacent? Self- satisfied; contented; kindly; as, a complacent temper; a complacent smile. vigilant, contented, pleased, sufficiency, comfortable, sufficient, unhappy. indulgent, over-confident, satisfied, accommodating, confident, lenient, happy, content, optimistic. discontent, unhappy, unsure, discontented, dissatisfied, concerned. timid, mindful, conscientious, fervent, humble, retiring, warm, bashful, zealous, keen, diffident, sheepish, shrinking, Self-reproving, mousy, heedful, introverted, unpretentious, attentive, shy, demure, meek, unassuming, aware, passionate, caring, unassertive, ardent, down-to-earth, modest, interested, warmhearted, sensitive, overmodest.
" Very possible," replied the General, with a complacent smile. There is always something complacent in pity - it means conscious strength.